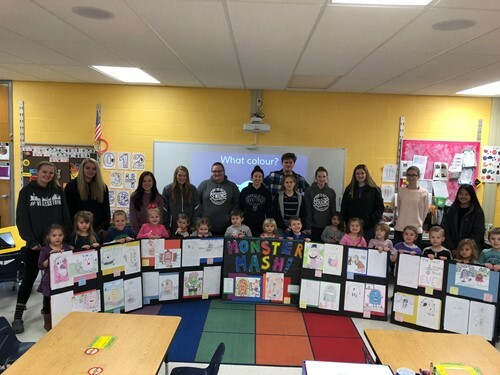 Students in Mrs. Auer's new Eclectic Arts class had an opportunity to collaborate with some young artists in Mrs. Hill's UPK class to draw some very creative monsters. The younger students worked their high school friends to brainstorm all kinds of fun and interesting features for their monsters. They discussed colors, textures, facial features, pastimes, and much more. The high school students then went to work using the UPK drawings and lists of information to bring their drawings to life. The culmination was a fun "Monster Mash" party where everyone got to see the monstrous results. It was a lot of fun to see these artist of different ages and abilities make connections and challenge each other with their creative ideas!